ALS or Amyotrophic Lateral Sclerosis is a progressive neurodegenerative disease that affects nerve cells in the brain and the spinal cord. ALS usually strikes people between the ages of 40 and 70, and approximately 20,000 Americans can have the disease at any given time. Although there is not yet a cure or treatment that halts or reverses ALS, scientists have made significant progress in learning more about this disease. ALS is a word that is all too familiar for Windham residence and Windham High School athletes. In 2010, Keith Taylor a father of standout student-athlete Jackson Taylor was diagnosed with ALS. The community and sports teams including basketball all joined in the effort to help raise awareness and support for the Taylor Family and their difficult battle. This year we have been informed of more devastating news in regards to one of our own being affected by this horrible disease, Jason Jacobe. Jason Jacobe was a 2002 graduate of Windham High School and lifelong teammate and friend of Head Boys Basketball Coach, Chad Pulkkinen. Jason, 33, was a three-sport athlete, competing in basketball, soccer, track, and field while at Windham and the valedictorian of the class of 2002. Jason’s academic and athletic accomplishments can be seen in the halls of Windham High School and his impact on his teammates are memories they will never forget. He was the epitome of what a student-athlete should be both on and off the playing field. His leadership and ability to rally guys around him were unmatched, he was the definition of a great teammate. Jason was diagnosed this summer with a non-hereditary version of ALS, which is referred to as Sporadic. Windham Basketball is asking the community and all you know to help raise awareness for this awful disease and if able to send contributions to the ALS Association (http://www.alsa.org/) which is the Association Jason has been involved in to help raise awareness and funds for research. There is no cure, but with our efforts, we hope to help ALS Association get closer to finding one. The Windham Boy’s Basketball Program will be dedicating a “Jacobe Jersey” to an individual each week who works the hardest, is a good teammate and is making his team better with his attitude every day. Jason Jacobe was and still is a staple of what every kid should strive to be and we hope to rally around him, his family, friends and show him our support. Please Help Jason and Liz by donating to their Go Fund Me Page. Being diagnosed with ALS back in February 2016 was such a surprise to Jason. After sharing, he is continuously asked: "What can we do to help?" Just asking is helping, but friends and family always seem to want to do more. If you feel the need to give personally, here is a way donate. We are not asking but wanted to provide a way. Born November 9, 1983, Jason Jacobe was a fixture on Windham sports fields for nearly two decades. Jason grew up playing youth sports such as baseball, basketball, and soccer throughout the years. As a 2002 graduate of WHS, Jason was a 3-sport varsity athlete in soccer, basketball, and track and field. In 2000, Jason helped lead the Eagles soccer team to the Western Maine Class A title game and was a named a team captain for the 2001 season. 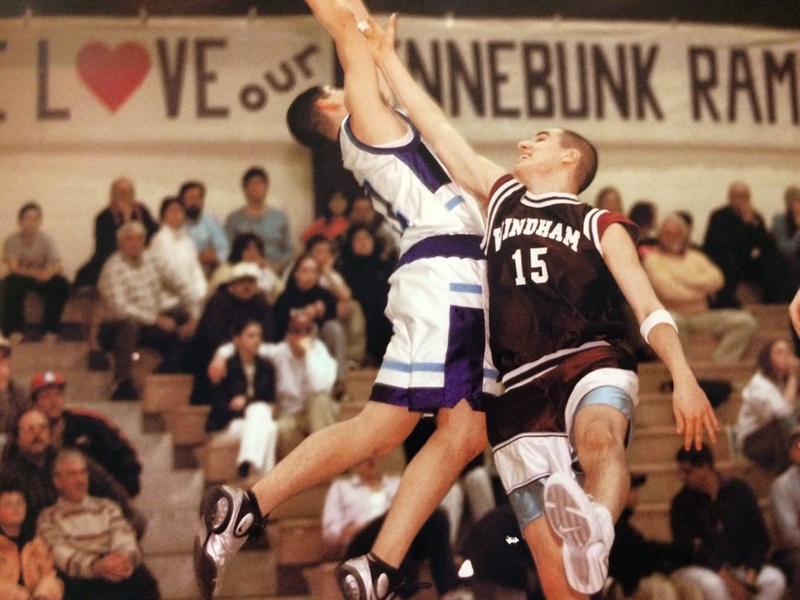 In 2001, Jason was selected for Southern Maine Athletic Association first team, Western Maine Class A first-team honors, and was an All-State honorable mention selection. In addition to excelling on the field, Jason earned SMAA all-academic team honors and graduated as the valedictorian of the WHS class of 2002. Jason continued his athletic career at the University of Maine, earning starts in all 4 seasons with the Black Bears Men’s Soccer team. Jason started in every game for the Black Bears in 2004 and 2005, and was named team captain in 2006. Jason continued to excel in the classroom and was named to the America East Commissioner’s Honor Roll in each of his 4 seasons. In 2004, Jason was named to the ESPN the Magazine CoSIDA Academic All-District Team. In 2006 Jason was named a Maine Scholar-Athlete, and received the M Club Dean Smith Award as the top male scholar-athlete. Jason graduated from Maine in 2007 with a B.S. in Mechanical Engineering, finishing with a 3.78 GPA. Jason now makes his home with his wife Liz and their dog Jackson in Sugar Hill, GA, outside of Atlanta.